Bike riding is about getting out and enjoying life on two wheels, but sometimes people don’t always feel confident. That’s where a Bicycle NSW membership makes all the difference. We are creating a better environment for cycling through our advocacy efforts in NSW. Events like Spring Financial Group Spring Cycle and Heart Foundation Gear Up Girl are crucial to our goals as they help increase participation in cycling and raise awareness of bikes as a great transport choice. Our Affiliated Bicycle User Groups across the state make cycling more accessible and welcoming for all. Not only does a Bicycle NSW membership give you great access to events like Spring Cycle, Gear Up Girl, Discovery Rides, local Bicycle User Groups, but it also gives you the best bike riders insurance for recreational cycling available in NSW^. 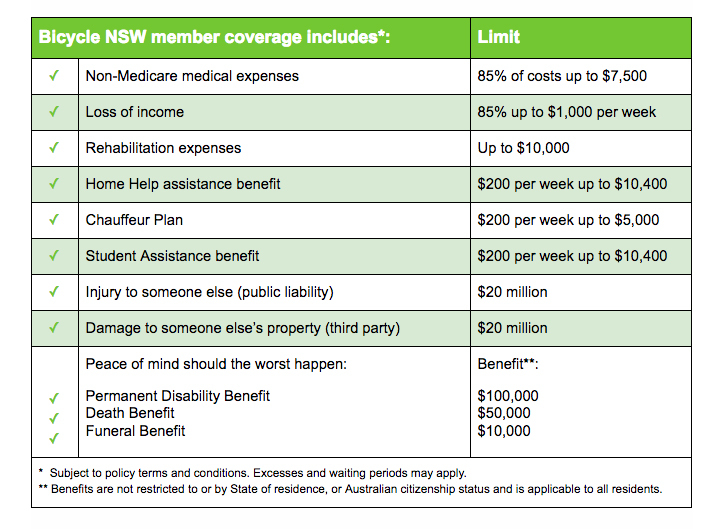 At less than 43 cents a day to cover an entire family, Bicycle NSW membership makes sense. Riding a bike is great fun, but accidents can happen. We’ve worked with V-Insurance to make sure that all Bicycle NSW members receive WORLDWIDE, comprehensive Personal Accident Insurance & Third Party Public Liability Insurance, so you can ride with confidence anywhere, anytime^^. Visit our Insurance Portal for further details on coverage, view the policy wording, make a claim and have all your insurance questions answered. CLICK HERE for information on how to make a claim, or to get the claims process started. ^^Bicycle NSW members insurance covers all kinds of bike riding (leisure, commuting, training), except for racing.